Bulgur is whole wheat, yellow-colored product which is precooked, dried, slightly scoured, pounded or grounded. It is known as the first food processed by man. Rice is the main food for about more than half of world’s population. Despite the constant development of food industry, both of them are widely used in today’s competitive cuisine. They are recommended by elder members of family as well as by nutritionists. Which features contribute to their significant and increasing usage? In an effort to find out the answer we gained insight into scientific aspects and revealed comparative advantages and disadvantages of them. From the very start it is necessary to point out that although bulgur is a precooked product, it preserves all nutritional components due to its specific processing. And, since we consume bulgur and rice cooked, all the comparative information below is outlined according to this state. As indicated in the data set out below rice wins with lower sugars, sodium, in some extend with lower price. On the other, hand bulgur contains huge amount of fiber, also is rich in protein and slow-releasing carbs. What about vitamins? 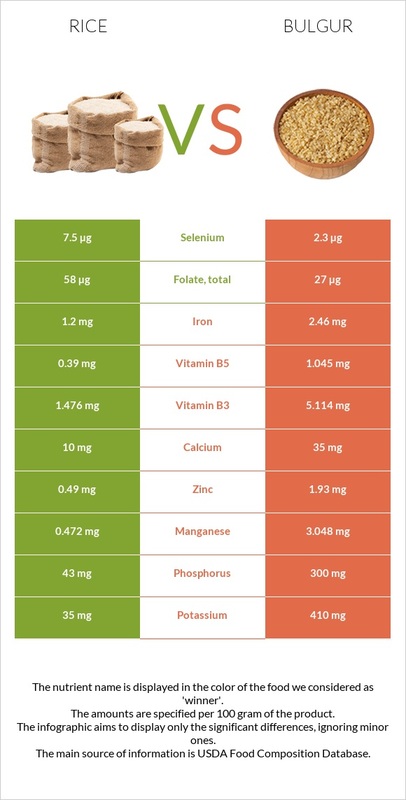 It is obvious from charts below that bulgur is richer in vitamins, especially in Vitamin B3 and Vitamin B6. However, at the same time rice contains higher Folic acid (B9), which is largely absent in bulgur. In terms of minerals content bulgur wins hands on. According to the charts of comparison bulgur is extremely rich in Magnesium and Phosphorus, and to a lesser extent, with Copper, Potassium, Iron and Zinc, whereas they almost non-existent in rice. It follows logically from what has been said that in nutritional content comparison bulgur can be considered the “title-holder”. That is why it is widely recommended by nutritionists and dieticians. There are several reasons for widespread use of bulgur and rice. We decided to emphasize some of them. From among the many global problems, starvation remains a challenge despite the increasing development in a wide range of areas. That is why food aid plays an essential part in many emergency and developmental programs. Bulgur is a very appropriate product for food aid (4) due to its nutritional and functional properties. Despite the less content of vitamins and minerals, rice is commonly used as a food aid product as well. These products are healthier and cheaper. Low in cholesterol and high in protein and fiber bulgur can help satisfy your hunger without adding pounds and prevents obesity, which makes it one of the preferable products of dieticians. On the other hand, rice sometimes is recognized as unhealthy, rich in carbohydrates. From this point let us smoothly move to health impact. Bulgur is higher in Vitamins B1, B3 and B6, which contribute to right function of the nervous system, the metabolism, provide us with the essential energy. On the other hand rice is rich in Folic Acid (B9), which is very important for prospective parents, because it plays a great role in а right formation of germ cells. It decreases the level of homocysteine in the blood, high levels of which lead to damage of blood vessels and formation of atherosclerotic plaques. Besides, it is crucial for development of embryo’s brain, especially during the first trimester of pregnancy. Bulgur is rich in fiber we need for healthy digestive tract, cardiovascular system, it improves blood sugar control. According to the study (1) published in April 2017 that assesses an exposure-risk for potentially toxic elements (PTE) in rice and bulgur, comparison of the determined concentrations to the available standard levels and the levels reported in the literature revealed that Cadmium, Cobalt, and Plumbum in rice might be of concern. The results of this study showed that health risks associated with PTE exposure through bulgur consumption are lower than those of rice. According to another study (2)(3) published in December 2013, rice contains more arsenic concentrations (160±38 ng/g) than bulgur, which result in risks of cancer and coronary heart disease. Bulgur conversion is an ancient process that originated in the Anatolia, the Middle East and the Mediterranean. It was a preferred dish of the armies of the Mongol emperor Genghis Khan. In approximately 2,800 B.C. , the Chinese emperor Shen Nung declared it one of five sacred crops along with rice, millet, barley and soybeans. Biblical references indicate that it was prepared by ancient Babylonians, Hittites and Hebrew populations some 4,000 years ago, and Arab, Israeli, Egyptian, and Roman civilizations record eating dried cooked wheat as early as 1,000 B.C. What about the rice? There is a long debate (5) around the origins of rice. Some archaeologists claim that rice originated from South-central China, others argue that according to evidence rice owes its origin to India, both of them could be dated back to approximately 5000 B.C. Today Chinese specifically dedicate one of the days of New Year festivals to rice. Due to specific processing technology and cooking operations bulgur is resistant to mold contamination, to formation of larva and insect attacks. According to studies bulgur remains very acceptable up to six months at 370 C. Shelf life of rice depends on different types. Most of rice types have an indefinite shelf life, except for brown rice. Given that it is a whole natural grain, its higher oil content spoils it easily than other types. Thus, to sum up, bulgur is higher in fiber and protein in nutritional comparison than rice. In mineral content bulgur is undoubtedly the winner too, particularly due to Phosphorus and Magnesium. Bulgur is also higher in vitamins, except for the Folic acid (B9), that is higher in rice. Both of them are widely used in Food Aid programs because of their nutrients, affordability and shelf time. On the other hand, some elements, revealed especially in rice, can lead to serious diseases, such as cancer and heart pathologies. The final choice is yours.